March 2008 Sunday 30th March dawned nearly cloudless with a light north-westerly breeze. 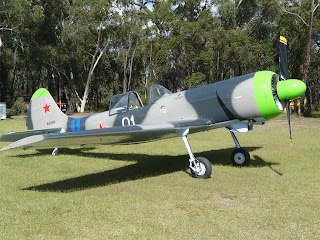 Perfect for the first flight of the beast in Australia; and also since its refurbishment in Lithuania. 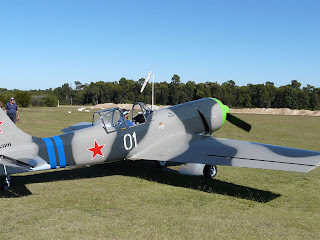 Yak-50 853101, also known as VH-DZY, was rolled out onto the grass for test pilot, Steve Curtis, to run through the pre-flight inspection. Peeking past the engine cooling shutters, the nicely overhauled and repainted engine looks neat and tidy - as it should! Pre-flight inspection completed and with Steve strapped in, the engine belched a few puffs of white smoke (visible below the wing, next to the right wheel) and rumbled into life. 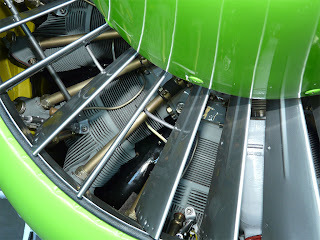 Radial engines need to be warmed up properly before flight. This gives the pilot time to run through other items in the checklist, and of course, acknowledge admiring looks from bystanders. Once warmed up, it was time to taxi to the runway area for run up checks before finally lining up for takeoff. With a short takeoff run of about 100 m, VH-DZY flashed past as it lifted off on its maiden flight in Australia. It was exciting to watch the big bird climb away rapidly into the blue sky and settle into its new life here.